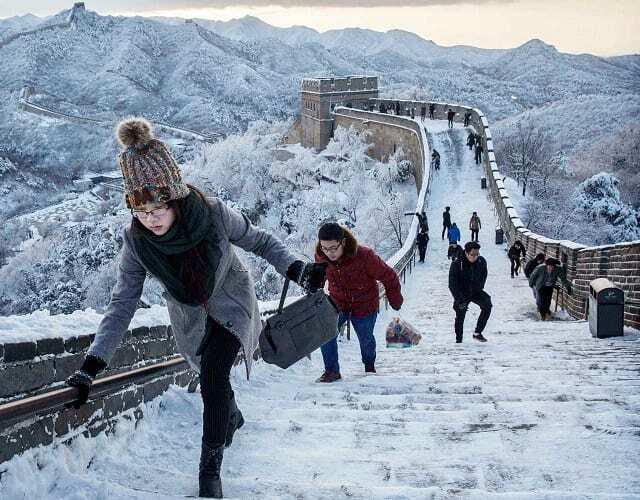 A new report showed that about 197 million visits were made by Chinese travelers for winter activities in the 2017-2018 winter – a year-on-year increase of 16 percent. During the period, winter tourism generated revenue of about 330 billion yuan (47.9 billion U.S. dollars), up 22 percent year on year, according to a report released by the Data Center of the Ministry of Culture and Tourism on Sunday. The report forecast that the number of tourists will reach 340 million in the 2021-2022 winter, with winter tourism revenue reaching 680 billion yuan. Investment in the winter tourism industry also posted strong growth. The report said investment reached 540 billion yuan in the 2017-2018 winter, according to incomplete statistics. The report was released on the sideline of the ongoing third Jilin Ice and Snow Tourism Industry Expo and 22nd Changchun Ice and Snow Tourism Festival, held in northeast China’s Jilin Province. Winter tourism has been booming in China since Beijing won its bid to host the 2022 Winter Olympic Games in 2015, as local governments of Beijing and the provinces of Hebei, Jilin and Heilongjiang have unveiled policies to promote winter tourism. DARWIN, Australia - An Italian tourist seeking directions has been seriously injured after being attacked by a rottweiler in Darwin’s northern suburbs.